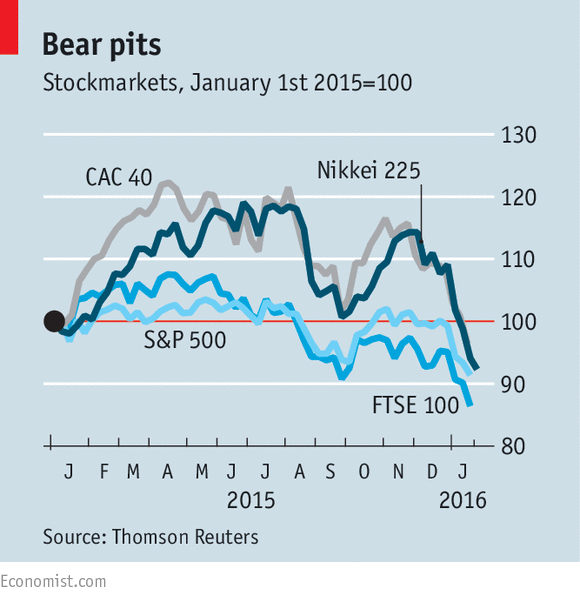 BEAR markets are triggered, by convention, when share prices fall by more than 20%. So the widespread stockmarket declines on January 20th took Tokyo’s Nikkei 225, London’s FTSE 100 and France’s CAC-40 into bear-market territory (see chart), since all had declined at least that much since their highs of last year. Mind you, another old saw is that bear markets do not end until prices pass their previous peak; on that measure, the Nikkei 225, which is less than half its 1989 high, is still caught in a 26-year-long bear run. The rich world is not alone in its ursine infestation. China’s CSI 300 index is more than 40% below last year’s high. The FTSE All-World Index, having breached the 20% mark, ended down 19% on January 20th. Indeed New York, although hit hard that day (the Dow Jones Industrial Average fell more than 500 points at one stage, before rebounding a bit), is one of the few big markets not to have entered bearish territory. Among the primary causes of the sell-off is worry about China’s economic health, despite the latest GDP numbers, published this week, that were in line with forecasts of 6.9% growth. Investors fear that the real numbers are worse than the official data suggest, and see the sharp fall in commodity prices, particularly oil, as evidence for the hypothesis of weaker Chinese demand. In a sense, equity markets are only catching up with the bearish implications of moves in other markets, such as the rise last year in corporate-bond spreads (the interest-rate premiums paid by riskier borrowers). Higher spreads usually reflect fears that more borrowers will default in the face of adverse economic conditions. Investors have also been rushing for the perceived safety of government bonds, with the yield on ten-year American Treasuries falling back below 2%. In June it was nearly 2.5%. Forecasts for global growth this year are being revised down, as they have been for the past few years. The IMF has cut its estimate from 3.6% to 3.4%. World trade has also been worryingly sluggish, with volumes falling in the first half of 2015. So far manufacturing appears to have been hit harder than services, with industrial production in America falling in each of the last three months of 2015. But a wide range of companies are facing a squeeze in profits. Macy’s, a retailer, IBM, a computer-services company, and Shell, an oil giant, all recorded big declines in their latest results. Overall, the profits of the constituent companies of the S&P 500 index in the fourth quarter of 2015 are expected to be down by almost 5% on the same period a year earlier. Part of the sell-off in global equities may reflect this reduced outlook for profits. In a recent survey of fund managers by Bank of America-Merrill Lynch, more than half expected profits to decline further over the next 12 months. Cash now makes up 5.4% of portfolios, the third-highest level since 2009. But fund managers are not as bearish as they might be: a net 21% of them have a bigger weighting in equities than usual and only 12% expect a global recession in the next year. Some also blame the Federal Reserve for pushing up interest rates in December. To the extent that monetary policy, via both low rates and quantitative easing, has pushed up asset prices since 2009, the fear is that tighter policy may drag those prices back down. But the stockmarket decline may be altering the outlook for monetary policy, too. Back in September, when the markets were suffering another tumble, the Fed stepped back from a rate rise, citing fears about a slowing global economy. Judging by the futures market, investors think the Fed will take fright again: they are now expecting it to raise rates only once this year, when previously they had been expecting three increases. This is going to be a difficult year for Germany, one in which the policies of the past may turn out to be unsustainable. The most unsustainable of all was Angela Merkel’s invitation to open the doors to Syrian refugees without limitation. The German chancellor must either have misjudged the effect or acted recklessly — or both. A few months and 1m refugees later, the discontent is growing inside the Christian Democratic Union, her party, and in the country at large. Gerhard Schröder, her Social Democratic predecessor, last week came out against the policy with exactly the same arguments as the right-wingers in Ms Merkel’s own party: Germany cannot absorb such a large number. More than 1m refugees arrived in the country in 2015. It could be twice as many this year and the same again next — more if you include family members who will eventually follow. It is tempting to think of refugees and migrants as a new source of labour. But in this case this just is not true, at least not for now. The majority of those who arrive in Germany lack the skills needed in the local labour market. They will enter the low wage sector of the economy, and drive down wages, producing another deflationary shock. This is the last thing Germany and the eurozone need right now. I expect that this policy will change at some point this year. What I do not see, however, is a successful political coup against Ms Merkel from inside her own party. What protects her is the grand coalition with the Christian Social Union and the SPD. There is no majority to the right of her, or to the left for that matter. 8 per cent of gross domestic product. A global downturn tends to affect German industrial companies with a delay of one or two years because many operate in sectors like plant and machinery where multiyear contracts are customary. But eventually, the German and the global business cycles begin to synchronise once more. This will be the year when that starts to happen. The third challenge for Germany in 2016 is the fallout from the Volkswagen emissions scandal. This could be the single biggest shock of all because Germany has been over-reliant on the car industry for far too long. Last week, suspicion fell on Renault, when the offices of the French carmaker were raided by the authorities. This is not the crisis of a single company, therefore, but of a whole industry. Nor is it just a German problem; it is a pan-European one. It appears that VW behaved more recklessly than the others, and it will pay a heavy price for its behaviour. Whether legal action in the US and in Germany will weaken VW or force it into outright bankruptcy is almost irrelevant, given the bigger picture. The real threat to VW and its European competitors comes not from the US justice system but from consumers who understand much better than before the trade-offs between a car’s performance, its price and emissions. This is a story about an old industry trying desperately to hang on to unsustainable levels of output and market share and of a country unwilling to wean itself off its overreliance on that industry. Finally, 2016 promises to be the year of backlash against German dominance of the eurozone. That did not happen during the crisis. The leaders of the countries in the eurozone periphery kept their heads down. Under German pressure, they signed up to treaties and legislation, such as the fiscal compact and the new resolution mechanism for banks, that were clearly not in their long-term interest. I am not sure that Matteo Renzi, the Italian prime minister, was particularly well advised to attack Ms Merkel in his interview with the Financial Times in December. But he is not alone. The Italian media, too, are becoming more hostile towards German dominance of the EU. Even if 2016 does not see another eurozone crisis, it could easily be a year of mutual alienation, which is more dangerous in the long run. While most of the threats appear to be external, they are caused by domestic policy choices. Germany does not have to rely on a single industry to such an extreme degree. And no country finds itself with an 8 per cent current account surplus by accident. Nor did Ms Merkel need to open up further a border that was already open by making so public a pronouncement. She made a choice. The chancellor has been in office for 10 years, so her future is a legitimate subject of speculation, and will remain so. But it should not be Germany’s main concern for now. There are more pressing things for it to worry about. AP The Galaxy Soho office complex in Beijing designed by architect Zaha Hadid: "Twenty years ago, we were only able to build boxes," says real estate developer Zhang Xin. In a SPIEGEL interview, billionaire real estate mogul Zhang Xin discusses the recent market crash, the end of China's building boom and why she views Facebook founder Mark Zuckerberg as a role model for the wealthy. The ascent of Zhang Xin, 50, who rose to become a real estate mogul, is a classical success story in modern China. As a young woman, she worked on assembly lines in the textile and electronics industries before going to England at the age of 19 to train to become an international secretary. She then completed degrees in economics and worked as an investment banker in London and on Wall Street. She returned to Beijing in 1995 and founded the commercial real estate development firm SOHO China together with her husband Shiyi Pan. Unusually for a Chinese business leader, Zhang also speaks out regularly on social and political issues. She sat down with SPIEGEL in Beijing for an interview as she prepared to travel to the World Economic Forum in Davos, Switzerland. SPIEGEL: Zhang Xin, if China's economy was an enterprise and you were running it, how would you make your company fit for the future? Zhang: No economy, no company, in fact no individual can develop its full potential today without embracing two fundamental trends -- globalization and digitalization. They will dominate for quite some time to come. SPIEGEL: What does this mean for China? Zhang: It means that the country needs to continue opening up and keep connecting. It needs to realize that the world has become one. The old concept of isolation, the idea that you can solve your problems on your own does not work anymore -- neither in cultural, economic, nor political terms. Isolation means a lack of growth. I grew up in China at a time when the country was completely isolated. That era is over. SPIEGEL: The booms and busts on the market during the summer and at the beginning of the year have shattered confidence abroad in China's economic power. How do you evaluate the extreme volatility on the capital markets? Zhang: Investors don't like uncertainty. The market is telling us that they need certainty, they need to see where the economy is heading. If the government is committed to continue the Open Door policy, they will need to come up with concrete policies and execution steps to increase confidence. SPIEGEL: China's leadership wants to transform its economy from an investment-driven to a service- and consumption-driven one. Will that work? Zhang: At the moment our consumption is still too small in terms of GDP. But we are heading in the right direction. SPIEGEL: Many China watchers wonder if this transformation will work. Zhang: The question is not about whether it will work or not. It's how quickly we can pull it off. Structural change will happen. When economies grow, there comes a time when you cannot rely on investment alone. We had that. The return on investment is becoming less and less. So we have to change. The old model doesn't work anymore. It's a question of speed. SPIEGEL: Your company is one of China's largest real estate firms. How has your business model changed over the years? Zhang: Twenty years ago, we were only able to build boxes. Today, architects from all over the world are working with us -- Zaha Hadid from London, Gerkan, Marg and Partner from Hamburg, Kengo Kuma from Japan. We brought design and digitalization from abroad to China. SPIEGEL: In comparison, how did things start out for you? Zhang: When we started out, we were among the first. Beijing had no and Shanghai had very few large buildings. At that time, it was all about building, building, building -- and then selling, selling, selling. We were working like a manufacturer. Soon, however, we realized that land was running out in Beijing and Shanghai. So we started keeping our buildings, and managing and renting them out. We became landowners. That was the second act. Zhang: Then we moved on to Act 3. China's economy became more complex. By now there is a large number of small- and medium-sized companies that work quite differently from big, state-owned enterprises. They don't follow any long-term business plan and don't rent office space for years to come. They start out and need an office right away, for a week, a month or half a year, and they want to be among other entrepreneurs like themselves. Our tenants now are companies like Uber, the taxi service, Meituan.com, China's version of Groupon -- and a large number of startups. These companies operate in a modern way, just like their customers: They go on the Internet, look for an offer and take it. SPIEGEL: After the stock market turbulences, does it surprise you that people have started to worry? Zhang: China has consistently surprised us. When I returned from the United States 20 years ago, it was unimaginable that we would end up where we are now. What China has achieved defies all logic. I credit this to the hard work and enterprising spirit of the Chinese people. SPIEGEL: Can you give an example? Zhang: I am a runner. Last October, there was a marathon here in Beijing. I didn't participate this time, but friends told me that the run wasn't prepared too well. The organizers had only arranged about three hours' worth of food and water supplies. Most people don't finish within three hours, however. Too bad for them -- or so it seemed. In fact, however, even those finishing last were perfectly taken care of, particularly during the fourth and fifth hour when demand is highest. Zhang: Because people along the route had realized that there was demand and quickly organized supply. That's so Chinese. In a well-organized country like Germany, such a problem may not have arisen in the first place, but in China people immediately recognized an opportunity. SPIEGEL: No one will doubt the diligence and flexibility of the Chinese, but will this be enough to avoid a hard landing of China's economy? Zhang: Growth will be slower, no one denies that. But the question is: Where are the chances and opportunities now? I see some positive and some negative trends. It's a good thing that it is getting simpler to register a company in China, it is good that the exchange rate of our currency is getting more flexible and that it's getting easier for Chinese businesspeople to travel. All of this opens up our economy. But it is a worry that there have been so many delays in the reform of China's state-owned enterprises. We all know that private companies are run more efficiently than state ones. These reforms are very much anticipated for the potential dynamism they could create. SPIEGEL: Are you worried about the many employees who might be laid off when the reform of the state-owned enterprises takes off? Zhang: China reformed its state sector before, in the late 1990s. Tens of millions were laid off at the time. That was scary and we had warnings of social unrest. But it did not happen. Instead, there was a restructuring in our economic system. I am not sure if China will follow a Western playbook in this respect. SPIEGEL: How do you mean that? Zhang: On the one hand the world is getting more integrated and we should not dismiss social values as "Western" when they are actually modern values. On the other hand, individual countries have their own history and their own evolution. Trade unions, for example, don't play the same role in China as they do in Europe or the US. SPIEGEL: You and other entrepreneurs of your generation have shaped an economic era in China similar to what was known as the "Gründerzeit" in 19th-century Germany. Is this era now coming to an end? Zhang: When we started out, we didn't really think that the era of great opportunity would end one day. We were much too busy developing our companies. But in today's China you can build a city, even a mega-city like Beijing or Shanghai, within 10 or 15 years. And then you are done. So in real estate development, the Gründerzeit is over. But that is not the case in other sectors. Zhang: I firmly believe that digitalization has only just begun in China. In addition to the taxi, transport, shopping and hotel businesses, many other industries will follow: education, health care, administration, even the legal branch -- everything, really. There is still a lot of opportunity in China for the inventive and ambitious ones. SPIEGEL: China's generation of founders has become rich over the past 20 years. What will you and the other 600 or so Chinese dollar billionaires do with your money? Zhang: Mark Zuckerberg recently announced that he will donate $45 billion of his wealth to philanthropy. Two years ago, my husband and I decided to endow $100 million to set up the SOHO China Scholars. This program will give financial aid to Chinese students so they can attend the best universities in the world. Many Chinese entrepreneurs are now donating for education; others support foundations in health care and research. None of us wants to be the richest guy in the cemetery. SPIEGEL: Europeans often see philanthropy as a sign that a state isn't doing enough in terms of social welfare and education. Zhang: That may be true, but it is worthwhile to engage in something that is close to one's heart. I had a scholarship. So if I donate money to give brilliant Chinese students an opportunity to study abroad, then this embodies everything I believe in: education, globalization, social mobility. I am an example of social mobility. SPIEGEL: In spite of its communist past, China often resembles America rather than Europe. Rich people earn admiration in China, not envy. Zhang: I have a profound dislike for showing off one's material wealth. This is insensitive and it is not what human hearts are made for. But what I like about China and sometimes miss in Europe is the entrepreneurial spirit of our young people, their ambition and dynamism. SPIEGEL: And the Chinese have this in common with the Americans? Zhang: Yes, and I think this explains to some degree why private engagement and philanthropy will play a big role here. I used to ask myself why American universities are financed through endowments. Now I know: During the early days of America, the state was poor and when citizens wanted to set something up, they needed to collect money themselves. Historically, this was different in Europe. There used to be a strong state, a monarch or a king. He provided money. SPIEGEL: In China there is a strong party. Can one get rich in China without the party? Zhang: Our company has only been active in Beijing and Shanghai, two very market-dominated cities. This was an advantage. Land is purchased here in public auctions, in a transparent way. When you do real estate development outside Beijing and Shanghai it is good to have "guanxi" -- good relations within the local government. SPIEGEL: Jack Ma, the founder of Alibaba, famously advised entrepreneurs to "love the party but not to marry it." Zhang: We are not very good at this. Our success rests on our international experience and on our ability to read the market. And I contest the notion that you can only succeed in China when you are well-connected. Neither my husband nor I are "princelings" -- children of influential people, that is. And yet China has enabled us to succeed. SPIEGEL: The party, however, has become quite rigid, not just with Chinese but also with foreign businessmen. Zhang: I think our legal system needs to be developed. Cases of citizens who are detained and then have to wait much too long for a trial -- that is scary, for everyone. When someone commits a crime he needs to be charged quickly. Why does this take so long in many cases? I don't know. Is it because our legal system is still rudimentary? China has promised to modernize its legal system. This has high priority. SPIEGEL: When countries prosper economically there comes a time when its people start asking for greater political participation. Will this eventually happen in China, too? Zhang: I said before that the Chinese no longer crave so much for food and accommodation, but they do crave democracy. I stand by that. I don't know which model China will follow. But the higher our standard of living, the higher our levels of education, the further people will look around. And we can see which level of openness other societies enjoy. We are no different -- we too want more freedom. The question is: How much freedom will be allowed? SPIEGEL: Today the silhouettes of your buildings dominate the skylines of Beijing and Shanghai, almost serving as a signature of modern China. Have you ever wondered how long these buildings will continue to stand tall and just how sustainable these structures that you have created together with your architects will be? Zhang: We have become so quick and effective in building things today. It would be easy to build another Pyramid of Giza or another Great Wall. But these buildings haven't withstood the test of time because of their building quality. They stand tall because they have a symbolic value, they represent a culture. I'm afraid what we are building today will not have the same impact and sustainability of the architecture of a 100, 500 or 1,000 years ago. The buildings of those days were miracles. We don't perform such miracles today. So we should be a little more modest. For my part, I'll be glad to show one of my buildings one day to my grandchildren and say: I'm proud of that. NEW DELHI – China’s ambition to reshape the Asian order is no secret. From the “one belt, one road” scheme to the Beijing-based Asian Infrastructure Investment Bank, major Chinese initiatives are gradually but steadily advancing China’s strategic objective of fashioning a Sino-centric Asia. As China’s neighbors well know, the country’s quest for regional dominance could be damaging – and even dangerous. Yet other regional powers have done little to develop a coordinated strategy to thwart China’s hegemonic plans. But coordinated action – or even agreement on broadly shared policy objectives – has remained elusive. In fact, a key element of America’s Asian pivot, the 12-country Trans-Pacific Partnership trade deal, does not just exclude China; it also leaves out close US allies like India and South Korea. That is not the only problem with the TPP. Once the lengthy process of ratifying the deal in national legislatures is complete and implementation begins, the impact will be gradual and modest. After all, six members already boast bilateral free-trade agreements with the US, meaning that the TPP’s main effect will be to create a free trade area (FTA) between Japan and the US, which together account for about 80% of the TPP countries’ combined GDP. The conclusion of the ASEAN-initiated Regional Comprehensive Economic Partnership – which includes China, India, South Korea, Japan, Australia, and New Zealand, but not the US – is likely to weaken the TPP’s impact further. Compare this to the “one belt, one road” initiative, which aims to boost China’s financial leverage over other countries through trade and investment, while revising the maritime status quo, by establishing a Chinese presence in areas like the Indian Ocean. If President Xi Jinping achieves even half of what he has set out to do with this initiative, Asian geopolitics will be profoundly affected. In this context, Asia’s future is highly uncertain. To ensure geopolitical stability, the interests of the region’s major players must be balanced. But with China eager to flex the political, financial, and military muscles that it has developed over the last few decades, negotiating such a balance will be no easy feat. As it stands, no single power – not even the US – can offset China’s power and influence on its own. To secure a stable balance of power, likeminded countries must stand together in backing a rules-based regional order, thereby compelling China to embrace international norms, including dispute settlement through peaceful negotiation, rather than military intimidation or outright force. Without such cooperation, China’s ambitions would be constrained only by domestic factors, such as a faltering economy, rising social discontent, a worsening environmental crisis, or vicious politics. Which countries should take the lead in constraining China’s revisionist ambitions? With the US distracted by other strategic challenges – not to mention its domestic presidential campaign – Asia’s other powers – in particular, an economically surging India and a more politically assertive Japan – are the best candidates for the job. Both India and Japan are longstanding stakeholders in the US-led global order, emphasizing in their own international relations the values that America espouses, such as the need to maintain a stable balance of power, respect the territorial and maritime status quo, and preserve freedom of navigation. Moreover, they have demonstrated their shared desire to uphold the existing Asian order. In 2014, while visiting Japanese Prime Minister Shinzo Abe in Tokyo, his Indian counterpart, Narendra Modi, took a veiled swipe at Chinese expansionism, criticizing the “eighteenth-century expansionist mindset” that was becoming apparent “everywhere around us.” Citing encroachment on other countries’ lands, intrusion into their waters, and even the capture of territory, Modi left little doubt about the target of his complaint. Last month, Abe and Modi took a small step in the direction of cooperation. By jointly appealing to all countries to “avoid unilateral actions” in the South China Sea, they implicitly criticized China’s construction of artificial islands there, which they rightly regard as a blatant attempt to secure leverage in territorial disputes – and gain control over sea lanes of “critical importance” for the Indo-Pacific region. Clearly, both Japan and India are well aware that China’s ambitions, if realized, would result in a regional order inimical to their interests. Yet, while they are committed to maintaining the status quo, they have failed to coordinate their policies and investments in Myanmar and Sri Lanka, both strategically located countries vulnerable to Chinese pressure. This must change. Asia’s main powers – beginning with Japan and India, but also including the US – must work together to secure a broadly beneficial and stable regional balance of power. To this end, naval maneuvers, such as the annual US-India-Japan “Exercise Malabar,” are useful, as they strengthen military cooperation and reinforce maritime stability. But no strategy will be complete without a major economic component. Asia’s powers should move beyond FTAs to initiate joint geo-economic projects that serve the core interests of smaller countries, which would then not have to rely on Chinese investments and initiatives to boost growth. As a result, more countries would be able to contribute to the effort to secure an inclusive, stable, rules-based order in which all countries, including China, can thrive. Gold stocks remain the pariah of the investment world. Despite gold's strong early-year gains, the stocks of its miners have slumped to new secular lows. This whole forsaken sector continues to languish at fundamentally-absurd price levels, an extreme anomaly that is long overdue to start unwinding. The gold miners will be bid massively higher to reflect their impressive profitability even at today's dismal gold prices. Just this week, the flagship HUI gold-stock index plunged to a major new secular low. On Tuesday as gold merely slid 0.3%, the HUI plunged 5.6% to 100.7. This was an astounding new 13.5-year secular low, reeking of capitulation since gold's price action certainly didn't justify such a disastrous reaction in its miners' stocks. That left already epically-bearish gold-stock sentiment even worse, which is hard to believe. The gold stocks are ultimately leveraged plays on gold, because prevailing gold prices determine their profitability. And all stock prices eventually migrate to some reasonable multiple of their underlying corporate earnings, gold stocks are no exception. Gold's overwhelmingly-dominant role in gold-mining profits has led this sector to amplify gold's price moves, typically by 2x to 3x in major gold-stock indexes like the HUI. So Tuesday's extreme 21.9x downside leverage was wildly outsized. Gold stocks actually got off to a strong start in early 2016, surging 9.9% in this year's first 4 trading days compared to gold's 4.7% gain. But as soon as gold pulled back, the gold stocks got sucked into the bearish maelstrom of the plunging general stock markets. So by Tuesday, the HUI was down 9.4% year-to-date compared to gold's 2.5% rally. Despite the vast bearishness arrayed against them, gold stocks held their ground for 5.5 long months. Despite gold slumping to 7 new secular lows in November and December, the HUI didn't fall materially under 105. Despite the Fed's first rate hike in 9.5 years in mid-December that was universally expected to obliterate gold, that support held. And that continued into 2016 despite plunging global stock markets. Even as of Tuesday's new low, the HUI had only lost 4.0% since its initial early-August bottom. Gold's price edged 0.2% higher over that span, while the benchmark S&P 500 stock index plunged 10.4%. With so many excuses to continue dumping gold stocks in the past half-year, their relative strength is a telltale sign of selling exhaustion. Pretty much everyone who wants out has already long since sold and exited. So this week's abrupt plunge to crazy new secular lows despite flat gold prices felt like a capitulation, which has been long overdue. The gold miners' stocks are radically undervalued fundamentally, they have been pounded for years technically, and the extreme bearishness long plaguing them couldn't possibly get any worse sentimentally. Everything is in place for gold stocks to carve a major secular bottom. While ironclad technical and sentimental arguments can be made for gold stocks reversing and mean reverting sharply higher, the fundamental case trumps everything else. Despite this sector's endless slide and universal antipathy, the gold miners' underlying profit fundamentals are what's going to turn around this left-for-dead sector. Gold stocks are truly trading at fundamentally-absurd price levels today! Since the vast majority of mining costs are effectively fixed during mine-planning stages, the dominant variable driver of gold-mining earnings is the price of gold. And the relationship between these profits and gold is leveraged, not linear. This reality is easy to grasp. Imagine a gold miner producing gold for $850 per ounce. In a $1050 gold environment, December's secular low, this miner earns a $200-per-ounce profit. The miners' costs don't change as gold rallies, so all those gains amplify the bottom line. Since those Fed-rate-hike lows, gold has climbed back over $1100 in 2016. At $1100 even, that's a 4.8% gold-price rally. Yet it still costs our miner $850 per ounce to produce, while selling that gold at $1100 now yields a $250-per-ounce profit. That's a 25% increase on less than a 5% increase in gold prices, excellent leverage! Since profits ultimately determine stock prices, essentially all that matters for the gold miners is the price of gold. Thus they have always moved in lockstep with gold, amplifying its price moves. But as this first chart of gold and the HUI reveals, a radically-unprecedented disconnect emerged in early 2013. And it has only worsened in recent years. The gold miners' stock prices are no longer reflecting prevailing gold levels. This week's bizarre capitulation selling pummeled the HUI to an extraordinary 13.5-year secular low. It was the lowest HUI close since all the way back in July 2002. Back then gold was trading near $305, and had yet to exceed $329 in its young secular bull. This Tuesday, gold closed near $1087 or 3.6x higher. Yet gold stocks were trading at levels last seen around $305. Does that make any sense at all? Absolutely not! Such an extreme pricing anomaly in any other sector would lead to a stampede of new buying. Imagine if Apple's stock was trading as if it could only sell its iPhones for 3/11ths of their actual selling price. Investors would rush in to buy this epic bargain, rapidly bidding up Apple's stock price until it reflected actual underlying cash flows. Only in ignored gold stocks can such a radical disconnect exist. This hard fundamental truth about the mind-boggling gold-stock undervaluation really irks people with a vested interest in seeing gold stocks spiral lower into oblivion. Gold-stock investors and speculators who succumbed to their own fear to sell into recent years' major secular lows need to believe that was a rational decision. So market commentators tickle their ears with endlessly-bearish gold-stocks-to-zero talk. Thus whenever I write about the fundamentally-absurd gold-stock prices and their unparalleled vast opportunities for hardened contrarian investors, I get attacked by the already-sold-low crowd. They have a desperate psychological need to perceive themselves as smart for selling low, they want to rationalize away their foolishness. So they argue that gold mining simply isn't profitable at today's out-of-favor gold prices. The implication is obvious, that gold stocks deserve to be priced as if gold was trading near $300 instead of $1100. If they can't earn any money, then their super-low price levels are probably fundamentally-righteous. As a lifelong student of the markets and contrarian speculator, I love investigating counter arguments. So every quarter after the gold miners have reported their earnings, I carefully analyze their results. Gold miners generally report quarters a month or two after quarter-end, so the latest read available is from 2015's third quarter. Back in mid-November I analyzed the results of all the elite gold miners in the leading GDX Gold Miners ETF. Consisting of the world's biggest and best gold miners, this excellent gold-stock benchmark perfectly mirrors the HUI. GDX's 35 component stocks reflect industry-wide fundamentals. I painstakingly scoured all the latest quarterly filings from all the GDX component stocks. Before I got into the financial-newsletter business 16 years ago, I was a Big Six CPA auditing mining companies. So I'm quite fluent in financial reporting and quarterly filings. The combination of all these Q3 results from all the elite gold miners included in GDX shows exactly where this industry's profitability is running today. I wrote a whole essay on that research if you want to dig deeper. It turned out that the average cash cost of the GDX gold miners was just $618 per ounce in Q3. That's their actual cost of production at the mine level. At today's $1100 gold prices, that implies cash operating profits of $482 per ounce! Such massive 44% margins would be celebrated in any other industry, but they are totally ignored in the gold miners. But cash costs are admittedly misleading, as mining costs extend far beyond these mine-level expenses. So back in mid-2013, the World Gold Council introduced broader all-in sustaining costs. These include all expenses necessary to sustain current production levels, adding in corporate-level administration, exploration, mine-development, mine-construction, and mine-reclamation expenses among others. The elite gold miners of GDX, who represent the vast majority of world gold production, reported average all-in sustaining costs of just $866 per ounce in Q3! This hard data reported to government regulators by the biggest and best gold miners drives a jagged stake through the heart of the popular myth today that gold mining isn't profitable. At $1100 gold, this industry can still earn a very impressive $234 per ounce! With all costs necessary to maintain and replenish current production levels not far above $850, there is zero justification for gold stocks to be trading as if gold was 3/11ths of its current levels. Now if this AISC metric was running at $1350, $250 over current gold prices instead of $250 under, you could certainly argue that almost any miserable gold-stock prices were fundamentally justified. But that's not the case today. The only reason gold stocks are trading at such fundamentally-absurd prices relative to their profitability and the price of the metal that drives it is extreme fear. Investors and speculators are understandably terrified of gold stocks after their horrific plunge since early 2013. That's when the Fed spun up its QE3 debt-monetization campaign to full speed, levitating the stock markets and sucking capital out of gold. Incredibly, the gold-stock lows today are far more extreme than those seen in that stock panic. This is true in both absolute terms and relative to gold. The more extreme any price anomaly in the markets, the higher the odds for an imminent reversal and the larger the inevitable subsequent mean reversion will be. Gold stocks' radical price disconnect has positioned them to be 2016's best-performing sector by far. This last chart distills down the immutable fundamental relationship between gold-stock prices and the metal which drives their profits into a simple ratio. Dividing the daily HUI close by the daily gold close yields the HUI/Gold Ratio. When tracked over time, it shows when gold stocks are both overvalued or undervalued relative to gold. And due to the extreme fear, they've never been more undervalued than today! When the HGR rises, the gold stocks are outperforming gold. That's what happens normally during gold uplegs since gold-mining profits leverage the price of gold. Conversely a falling HGR signals that gold is outperforming gold stocks. This usually happens when gold is falling slower than gold stocks. Note that this ratio has been falling on balance for over 8 years now, an extraordinary secular span of time. The last time the financial markets were normal was before 2008's stock panic, before the desperate Fed implemented QE and ZIRP and wildly distorted everything. Over the 5-year span ending in mid-2008 just before that epic panic, the HGR meandered in a tight trading range between 0.46x support and 0.56x resistance. On average the HUI traded at 0.511x the price of gold, with only minor and short-lived deviations. That strong relationship was shattered by 2008's stock panic, the first since 1907. A panic is technically a 20%+ plunge in the broad stock indexes within a couple weeks. Leading into early October 2008, the benchmark S&P 500 plummeted 25.9% in just 10 trading days! The leading VIX fear gauge skyrocketed to 79.4, and gold-stock traders panicked like everyone else. That battered the HGR to a 7.5-year low of 0.207x. But once again those horrendous gold-stock price levels weren't fundamentally justified. They were just the result of epic fear that soon had to dissipate, just like today. So the HUI soon reversed and started to mean revert dramatically higher. The gold stocks climbed 319% over the subsequent 2.9 years, which earned fortunes for brave contrarians mentally tough enough to buy low when everyone else was too scared. If there was a normal period after 2008's stock panic, it was 2009 to 2012. Everything went crazy again in 2013 as the Fed ramped up its unprecedented open-ended QE3 bond-monetization campaign, which levitated the stock markets. The aggressive Fed jawboning about expanding QE3 if necessary any time the stock markets sold off created an effective Fed Put, so traders sold everything else including gold to buy stocks. Stock investors dumped the flagship GLD gold-ETF shares at an epic record rate in early 2013, which cratered gold and obliterated gold stocks. That sparked such extreme fear that it hasn't dissipated to this day, leaving this hated sector unable to stage any meaningful uplegs in the QE3 era. But back before that in 2009 to 2012, the HGR stabilized at a new post-panic average level of 0.346x. The relentless ongoing gold-stock selling culminated this week in that capitulation day, forcing the HGR down to 0.093x. The HUI was trading at less than 1/10th prevailing gold-price levels! That tied the all-time HGR low from late September 2015. The gold stocks had never traded lower relative to gold, the metal that drives their profits and thus determines this sector's fundamentally-righteous stock-price levels! With the exception of gold stocks' sharp mean-reversion rally in 2009, they've been falling relative to gold for over 8 straight years now. No market moves in one direction forever, they are all forever cyclical. And gold stocks are certainly no exception. As the Fed's radical market distortions created by QE and ZIRP continue to unwind, both gold stocks and gold itself will mean revert far higher to reflect their fundamentals. And that imminent mean reversion out of unsustainable fear-driven extremes portends enormous gains for gold stocks in the next couple years. Merely to return to that post-panic-average HGR of 0.346x at today's gold prices would require the HUI to rocket about 275% higher from this week's capitulation low to 375! That's where gold stocks should be trading near $1100 gold, as proved in 2009 when $1100 was last seen. Gold stocks are so despised, so incredibly undervalued, that they need to nearly quadruple from here merely to reflect today's low gold prices! Is there any other sector in all the stock markets with such huge potential fundamentally-driven gains? Not a chance, especially with a major new stock bear awakening. Gold and therefore gold stocks move counter to stocks and rally during stock bears, a rare and valuable attribute. But that easy-quadrupling potential from these extreme secular gold-stock lows greatly understates their potential. Why? Because gold itself is also overdue to mean revert dramatically higher in 2016 as the Fed's gross market distortions unwind. Late last year when everyone hated gold, I laid out the strong case for a massive 2016 upleg. And gold has already started powering higher on an investment-demand renaissance. I don't know how high gold will surge this year, but 20% is very conservative. A 20% gold rally would leave this metal near $1275, in line with year-end targets from some major Wall Street banks. At $1275 gold and the post-panic-average 0.346x HGR, the HUI's price target would climb over 440. That's a 340% gain from this week's capitulation low! And gold stocks' potential in coming years is even greater than that. 2012 was the last normal year before the Fed unleashed QE3 and destroyed the normal functioning of the markets. Gold averaged nearly $1675 that year. So gold's potential mean reversion out of its Fed-conjured extreme lows is to far-higher price levels than a mere 20% upleg. On top of that following any extreme, mean reversions tend to overshoot proportionally in the opposite direction. Think about that for a second. At Zeal we've long specialized in this obscure contrarian realm. We've spent 16 years researching and trading the precious-metals miners and explorers, earning fortunes by buying low when few others would so we could later sell high when few others could. And with gold stocks' fundamental disconnect so darned great today, there's never been a greater buying opportunity. So we've been aggressively deploying. All these new gold-stock and silver-stock trades are detailed in our acclaimed weekly and monthly subscription newsletters. They draw on our decades of exceptional experience to explain what's going on in the markets, why, and how to trade them with specific stocks. With a new general-stock bear upon us, it's exceedingly important to cultivate a studied contrarian perspective. Don't procrastinate, subscribe today! The bottom line is gold stocks remain at fundamentally-absurd price levels relative to gold which drives their profits. Heavy capitulation selling just forced them to 13.5-year secular lows, prices last seen when gold traded just over $300. Such a radical fundamental disconnect driven by irrational fear can't persist, especially with gold already starting to mean revert higher. Gold-mining profits will leverage its coming gains. Gold-stock prices can't defy their underlying profitability forever, so their long-overdue mean reversion far higher will soon be underway. This gold-stock rally will feed on itself, attracting widespread interest during an accelerating general-stock bear where upside momentum is hard to find. The early contrarians willing to buy in near these lows stand to multiply their wealth and earn fortunes. Will you be among them? As we enter 2016, we are only beginning to see this Epocalypse form through the fog of war. The war I'm talking about is the world war waged furiously by central banks against the Great Recession as the governments they supposedly serve fiddled while their capital burned. The Epocalypse that I've been describing in this series will overcome that resistance during 2016 and 2017 as it wrecks economic havoc to such a degree that cash hold-outs will be ready for whatever holds the greatest promise of saving them from their collapsed monetary systems, fallen banks, deflated stocks and suffocating debt. One has only to think about how quickly and readily American citizens forfeited their constitutional civil liberties after 9/11 when George Bush and congress decreed that search warrants were not necessary if the government branded you a "terrorist." THIRTY years from now, Americans, Japanese, Europeans, and people in many other rich countries, and some relatively poor ones will probably be paying for their shopping with the same currency. Prices will be quoted not in dollars, yen or D-marks but in, let's say, the phoenix. The phoenix will be favoured by companies and shoppers because it will be more convenient than today's national currencies, which by then will seem a quaint cause of much disruption to economic life in the last twentieth century. At the beginning of 1988 this appears an outlandish prediction. As we near their prescient date of 2018, The Economist's prediction doesn't appear even slightly outlandish. If it still seems outlandish to you, read on. You'll see how the cashless movement gained huge momentum throughout the world in 2015 in the articles referenced below where the voices and actions of numerous economists and governments press for the formation of a global cashless society. It may have been a long time coming, but it's certainly not hard for anyone to see now that the world's currencies are, indeed, crashing all around us as we near the coming of this seemingly messianic money that was predicted to resurrect from the ashes of the world's fallen currencies. The central banks are now clearly losing their battle against the Great Recession. Instead of saving the world, they have created a raging beast with many heads that are emerging all over the world -- commodity price crashes, junk bond crashes, currency crashes, global stock market crashes, hedge fund crashes, bank crashes and national bankruptcies. All of these developed because of the greatest money creation and lowest interest rates in the history of the world. That last extravagant phrase -- "in the history of the world" -- is the kind of expression usually said as an exaggeration; but this time, brazen as it sounds, we all know it is not an exaggeration at all. It's a brave new world that can look a statement like that in the eye and not flinch because it knows it to be entirely accurate. Central banks have truly engaged in the greatest inflation of money supply ever known on a global scale... and the result is going to be the explosion of these many overinflated monetary systems followed by the need to create something new as their replacement. The collapse of national currencies is unfolding as you read this. It can be seen in Greece, Italy, Brazil, China, and Russia, to name the most obvious. China's crash in the value of the yuan, compared to other currencies, appears intentional, as a way to boost trade by lowering the price of Chinese exports relative to other currencies; but it is not clear that it is intentional because its descent has been repeatedly jarring. The devaluations of the yuan is likely to ignite a currency war between nations. China is certainly declaring a currency war with the US dollar by unpegging the yuan from the dollar while getting the yuan accepted by the International Monetary Fund as one of the IMF's few global trade currencies, making it a direct competitor to the dollar for global dominance in the money marketplace. China intends for its currency to challenge the petrodollar and, so, along with Russia has been (as reported here for a couple of years) divesting from US treasuries to reduce its holdings in dollars so that it is not damaged when the dollar collapses, which it will if it loses its petrodollar status as the world's main trade currency. The Italian financial meltdown that we have been waiting for has finally arrived.... Italian banking stocks continued their collapse for a fifth consecutive day on Wednesday, and nervous Italians are beginning to quietly pull large amounts of money out of the banks. One doesn't have to look far back into the unfolding global economic collapse to recall people rapidly pulling money out of banks in Greece. Before that it was Cyprus. Brazil is facing similar problems. Soon it may be Puerto Rico as that government moves into bankruptcy. The stock markets of eleven European nations have fully succumbed to becoming bear markets. China's is a bear market. Russia's is a bear market, and the US is within an easy day's journey of becoming a bear market. It is now bobbing along on the price of crude oil. Probably the only thing holding the US market's head above water is the flight of capital from everywhere else in the world. Because the Epocalypse is a global economic collapse that is creating global currency wars and national currency collapses, it will beg for a global economic and monetary solution. That solution is already in the making all over the world. At the same time central banks have been battling the Great Recession, their many member banks and the governments they are supposed to serve have been waging a war on cash. The People's Banks of China (PBOC) , for example, has been planning to make the yuan a cashless currency since 2014. Issuance of digital currency can help reduce costs, curb crimes and money laundry, facilitate transactions and boost central bank's control on money supply and circulation, PBOC says in statement on website after concluding a seminar today. PBOC has asked its research team, which was set up in 2014, to study application scenarios for digital currency and strive for an early rollout.... It can reduce the traditional distribution of digital currency note issue, the high cost of circulation, improve convenience and transparency of economic transactions and reduce money laundering, tax evasion and other criminal acts to enhance the central bank's money supply and currency in circulation control, better support economic and social development, the full realization of inclusive finance help. Future, digital currency issuance, circulation system also helps build our new financial infrastructure construction, further improve China's payment system, improve payment and settlement efficiency, promote economic quality and efficiency upgrades. What government wouldn't want all of that as it seeks solutions to the death of its current currency? And what international bank wouldn't want that? "Virtual currencies and their underlying technologies can provide faster and cheaper financial services, and can become a powerful tool for deepening financial inclusion in the developing world," IMF Managing Director Christine Lagarde said in a statement Wednesday to accompany the report. "The challenge will be how to reap all these benefits and at the same time prevent illegal uses, such as money laundering, terror financing, fraud and even circumvention of capital controls." In Canada, the biggest rival MasterCard Inc. is working to obliterate, according to its local president Brian Lang, isn't Visa Inc., American Express Co., Interac Association or Bitcoin dealers. It's cold, hard cash. Lang states that Visa and Interac are working toward the same goal of establishing a cashless society ... or, as he spins it, a "digitally enabled country." His expressed objections to cash, besides the fact that it is bulky and dirty, is that it leaves no trace of its movement. And that is the part where you may want to become concerned because that is the argument that has governments now moving toward becoming cashless societies. They want to know what you've done with your money, to have a better pulse of the economy and of the taxes you should be paying, but cash is anonymous. Government doesn't like anonymous because anonymity can't be controlled. National economic boundaries are slowly dissolving. As the trend continues, the appeal of a currency union across at least the main industrial countries will seem irresistible to everybody except foreign-exchange traders and governments. In the phoenix zone, economic adjustment to shifts in relative prices would happen smoothly and automatically.... The absence of all currency risk would spur trade, investment and employment. You see, major financial publications are now deeming cash as the criminal that causes "economic distortion." Imagine that! Cash is the cause of economic distortion! No, it's not central banks with their trillions of dollars of free cashless money that caused all the distortions that are now bringing an economic apocalypse down on our heads; its that much smaller part of the money spectrum that is made up of cold cash and paper bills that is causing all the troubles. It allows you too much economic freedom to operate outside of the banks and the government's control over the economy. The existence of cash -- a bearer instrument with a zero interest rate -- limits central banks' ability to stimulate a depressed economy. Electronic money also permits innovations to reward law-abiding businesses. Value added tax, for example, could be automatically levied -- and reimbursed-- in real time on transactions between liable bank accounts. Countries that struggle with tax collection could go a long way in solving their problems by restricting the use of cash. Greece, in particular, could make lemonade out of lemons, using the current capital controls to push the country's cash culture into new habits. They want to control your spending habits and the things you do to mitigate your risks. It's all about controlling and monitoring your behavior as a consumer. You see, those businesses that operate primarily in cash might be criminals. Naturally, criminals do love cash because they must have anonymity. The philosophy is rapidly gaining ground, as a result of that truth, that anyone preferring cash may be someone who needs anonymity for nefarious reasons. Then it progresses from "may be" to "likely is." Therefore, the article in this highly regarded financial publication advocates that governments start fining people who use cash, as if all of them are bad guys. The writer says that governments should make cash users "pay for the privilege of anonymity"so they will choose to work more with electronic money and, thus, "remain affected by monetary policy." "Affected" is a nicer word than "manipulated" or "controlled." A proposed new law in Denmark could be the first step towards an economic revolution that sees physical currencies and normal bank accounts abolished and gives governments futuristic new tools to fight the cycle of "boom and bust". ...Officially, the aim is to ease "administrative and financial burdens", such as the cost of hiring a security service to send cash to the bank, and is part of a programme of reforms aimed at boosting growth - there is evidence that high cash usage in an economy acts as a drag. But the move could be a key moment in the advent of "cashless societies". And once all money exists only in bank accounts - monitored, or even directly controlled by the government - the authorities will be able to encourage us to spend more when the economy slows, or spend less when it is overheating. Isn't that nice? The aim is to encourage us to spend in ways that are helpful to all. You can become their little financial automaton. If you're not taking out enough debt to keep the debt-based global economic system percolating, they can "encourage" you to do more, as the Financial Times writer suggested, by levying a fee on your holdings so that it is better to spend than to save. That way, when you get in trouble, you have no savings and have to take out a loan. You cash hoarder! You are the reason the economy is dying, not the central banks! Their plan would have worked if you had not subverted it with your cashy behavior! The Epocalypse did not happen because it is impossible in the first place to create sustainable wealth out of debt; it happened because you are not participating as you should in the debt scheme! Once the old dinosaur economy dies and the blame is fixed squarely on you, becoming a cashless society will give the government means to "encourage" you to loosen your wallet a bit, spread your phoenix-like wings and spend more. Wasn't that one of the founding roles of government -- to cajole you toward the right economic behavior? Having everyone's account at a single, central institution allows the authorities to either encourage or discourage people to spend. To boost spending, the bank imposes a negative interest rate on the money in everyone's account - in effect, a tax on saving. The most amazing thing to me is that people were openly writing this stuff in 2015 as if it was perfectly acceptable, and apparently it was because I didn't hear much backlash. What about the opposite situation - when the economy is overheating? The central bank or government will certainly drop any negative interest on credit balances, but it could go further and impose a tax on transactions. So whenever you use the money in your account to buy something, you pay a small penalty.That makes people less inclined to spend and more inclined to save, so reducing economic activity. Beautiful! You see how tidy that is? If you, the consumer, get a little too reckless in your disregard for risk, your favorite central banker can help rein you in by tagging a fee to each transaction to your purchases as a friendly disincentive to overspending. And, perhaps if the government doesn't like certain vices, it can add a little extra tax of its own to those expenses. Isn't that fun? If consumers as an aggregate are getting carried away, the government can help save you from their mass recklessness. This is a special world. Such an approach would be a far more effective way to damp an overheated economy than today's blunt tool of a rise in the central bank's official interest rate. You see, you're already moving that direction on your own anyway. You can be sure that in the two years since that study, the number has become even less than 44% of Canadian transactions being by cash. It is not just governments that are on the cashless bandwagon because it gives them total control; it is citizens, too, (because we all find it handy so long as we're not forced to go cashless). So, this trend toward total government and bankster control is a conveyor you are most likely already on ... by choice. As I reported in an earlier article, "Cashless Society Has Arrived, and It's Global," most Scandinavian countries have already gone this way or have made major strides in that direction. Those Scandinavians love a good socialist answer to everything. So, what you might have thought sounded like conspiracy at the beginning of this article is actually the norm in Scandinavian societies. Electronic money is an inclusive and convenient system, giving poor and rural sectors of an economy - where cash machines and bank branches may be few and far between and not all people have accounts - a tool for easy participation in the economy. You see, cash is cumbersome to the poor. What if they cannot get to a cash machine to get some? Your government is here to save you. Cash is an escape valve that puts you outside of their assistance. According to Leaviss, if you're standing outside the electronic cash economy, you're part of the "black economy." You know, that hole in the eur-ozone that is full of death rays from outer space. You are one of the characters wearing the black hats. Why else would you choose to be so elusive and choose to avoid participating in the government's control over the economy that is intended for the good of all society? Do you see how the argument is shifting toward cash being evil and those who use it being part of the problem, instead of part of the solution? Get on the debt-credit wagon and join the race -- the human race. Evolve, for crying out loud! You're holding the economy back, you red-eyed fiend! Bankers now see how the technology that makes Bitcoin work is something they can use. They get it now ... and you're about to ... especially once Bitcoin is out of the way as an alternative. My old friend (without the "r") Bank of America is also chasing the technology now. And NASDAQ is pursuing it for processing equity transfers. No surprise that the US Federal Reserve and the Bank of England are in on the exploration, too. Suddenly everyone wanted Bitcoin, and just as suddenly it is going bankrupt. With all of that (and additional articles for further reading below), how much do you want to bet that the answer arising out of the developing economic apocalypse will be a digital solution? It will also be a global solution to a global problem. After all, don't global catastrophes need global answers? If the Epocalypse creates enough fear and suffering due to economic collapse, people will sell out their freedom for security. So, stop being part of the problem! In the sixties people burned their bras. It's time now to burn your bucks. Join the revolution! Break the buck! That day is nearly here. It will just take a solid economic collapse to soften you up into ready acceptance of the final solution.